Starbucks provides a water bowl—but no lattes—for them. 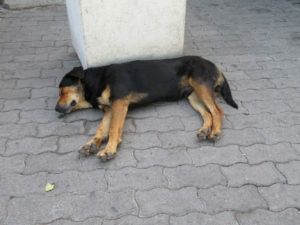 In the U.S. stray dogs are captured and adopted, or euthanized. I understand that previous efforts to round them up have resulted in a public outcry. 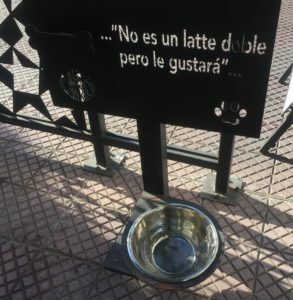 The people of the Chilean capitol love their canines and have resisted efforts to control the population. I ran across an article that discusses spaying or neutering the dogs, but from what I’ve seen on the streets, it’s not effective. It appears to be a symbiotic relationship. 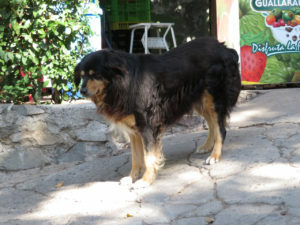 A tour guide explained that dogs tend to be territorial and protect neighborhoods and people. 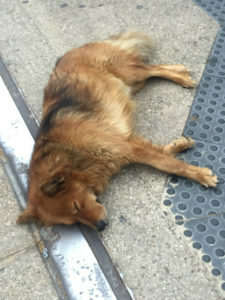 One dog that lived at the university was friendly to students, but aggressive towards strangers, including police that came to control protests. But from what I’ve observed, this is the most laid-back dog population in the world. 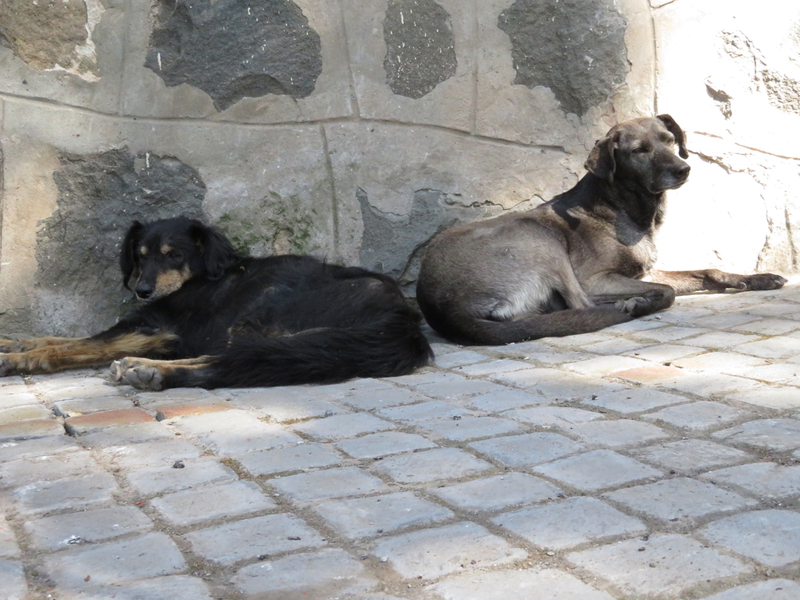 I haven’t seen any in fights, only on occasion do they bark at each other or passersby, and I’ve seen them ignore cats. 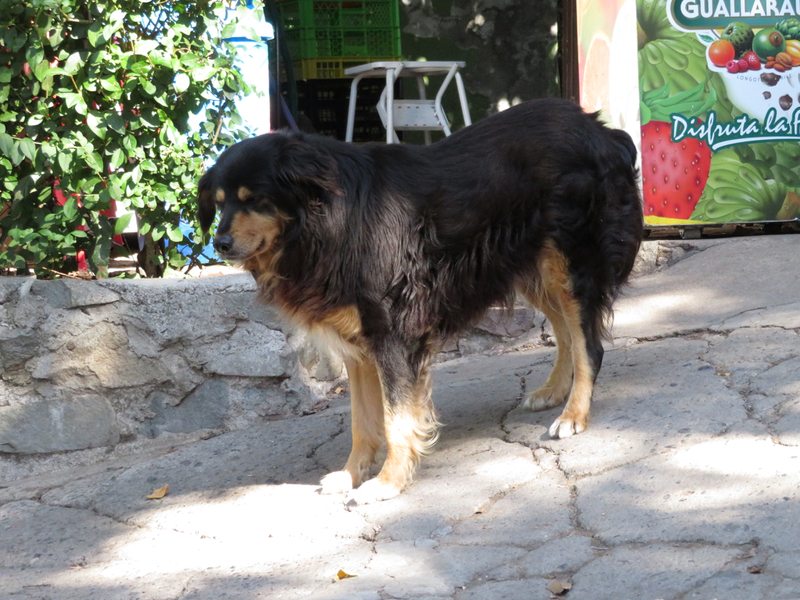 One morning on our way to our Spanish language school a friendly mutt followed us almost all the way on our fifteen-minute walk. Telling it to go away did no good—maybe my Spanish wasn’t clear enough. Each time I looked behind expecting him to be gone, he was our loyal companion. Although we love dogs we resist the urge to pet these as we understand that some carry scabies or other communicable diseases. If we lived here permanently, it would be tempting to give one a true home. We see them in parks, snoozing on street corners, and bedded down in gardens. We went to sit in a church one Sunday—we had just missed the service—and one was snoozing on the cool stone floor. 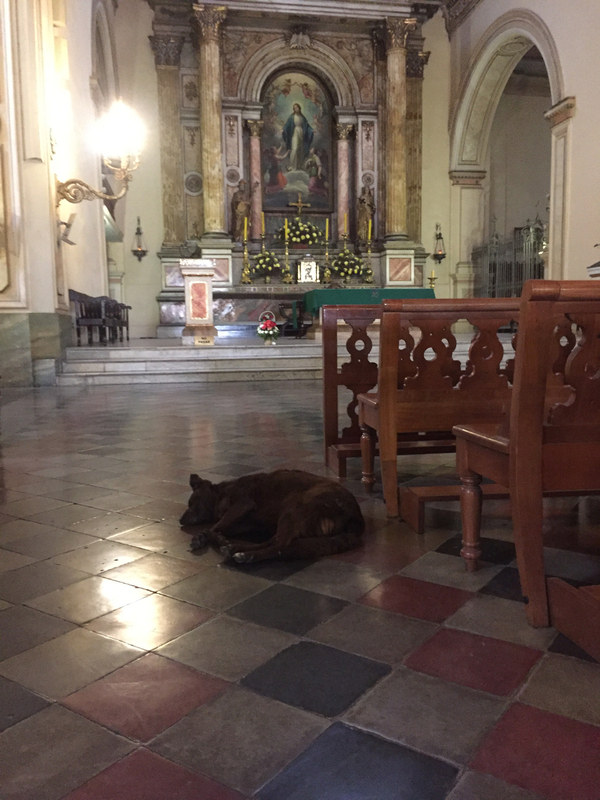 I don’t know if the saying, “All dogs go to heaven” is just a nice sentiment, but I do know that at least one goes to church. 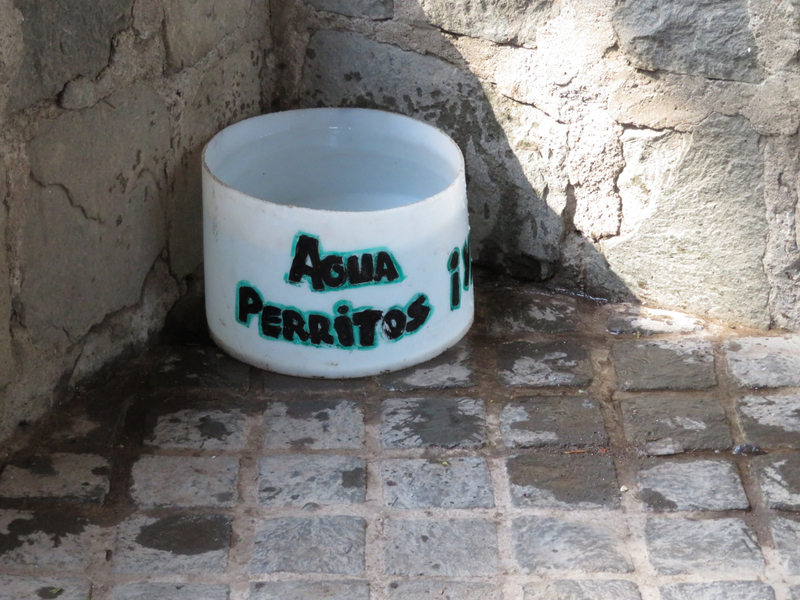 The street dogs of Santiago are just one more example of what we’re learning in this life on the road. Things aren’t always better or worse in different places, they’re just different. Travel Update. We’re just starting week three of a four week Spanish intensive course in Santiago. It’s been hard work, fun, and we’re learning a lot. In two weeks we head to Rio de Janeiro and area for ten days to meet up with friends who live there. Then we return to Chile for about six weeks. Have not figured out exactly where we’ll stay when we return. So many choices. Great story about the stray dogs. Guess I have a soft spot since putting our 11 year old lab down last easter. Our daughter Hannah (Navy ROTC- -pilot wannabe) will be heading so Santiago for study abroad next Spring 2019. Am forwarding this to her. We love dogs too, and have mixed feelings about seeing them on the streets. But they appear to be well adjusted. We still miss our cocker-terrier mix, even six years after he’s gone. Glad to share info about Santiago with your daughter. Great city. I bet she’ll enjoy it.